An artist's illustration of the Thirty-Meter Telescope atop the volcanic peak of Mauna Kea in Hawaii. A telescope that will be one of the largest in the world has been given the green light to be built atop a dormant Hawaiian volcano. The Hawaiian government's Department of Land and Natural Resources has granted a permit to the University of Hawaii to build and operate the $1.3 billion Thirty Meter Telescope (TMT) on Mauna Kea, a 13,803-foot (4,207-meter) volcanic peak on Hawaii's Big Island. The permit, which was approved Friday (Feb. 25), is the final step in a multi-year vetting process that took the project's cultural and environmental impacts into account, TMT officials said. "The Thirty Meter Telescope has worked diligently during the past three years to design an observatory that would minimize its environmental and cultural impact," Sandra Dawson, TMT’s Manager of Hawaii Community Affairs, said in a statement. "The TMT project also fulfills the requirements outlined in the recently approved Comprehensive Management Plan for Mauna Kea." The new telescope will scan the heavens in a range of wavelengths, from the ultraviolet to the mid-infrared. Its 98-foot-wide (30 m) primary mirror will give the telescope nine times the light-collecting power of today's most powerful telescopes in the optical/infrared range of the light spectrum, project officials said. For comparison, Hawaii's Keck Telescope — a go-to instrument for confirming many of the alien planet candidates detected by NASA's Kepler mission — has a mirror 33 feet (10 m) wide. 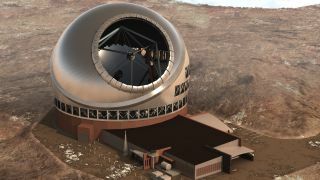 Telescope officials said the new instrument could begin construction next year and start making observations around 2020, according to the Honolulu Star-Advertiser newspaper. After a five-year global campaign to identify the best place to put the huge new observatory, project officials chose Mauna Kea in July 2009. Thirteen other telescopes already sit near the volcanic peak's summit, attesting to its prime viewing conditions. The telescope project has completed an environmental impact statement, which was approved by Hawaii's then-governor Linda Lingle in 2010, officials said. The permitting process also began that year, and public hearings were held this past fall to let locals comment on the telescope proposal. Not all Hawaiians are in favor of the Thirty-Meter Telescope. Some have voiced displeasure about the project because they consider Mauna Kea sacred, the Honolulu Star-Advertiser reported. On Friday, Hawaii's Department of Land and Natural Resources approved the telescope's application, green-lighting its construction and operation on Mauna Kea. However, not everything is completely settled; the DNLR also approved opponents' request for one final hearing to make their case against the telescope, according to the Star-Advertiser. The project is an international collaboration whose partners include Caltech, the University of California, the Association of Canadian Universities for Research in Astronomy, the National Astronomical Observatory of Japan, the National Astronomical Observatories of the Chinese Academy of Sciences and the Department of Science and Technology of India.